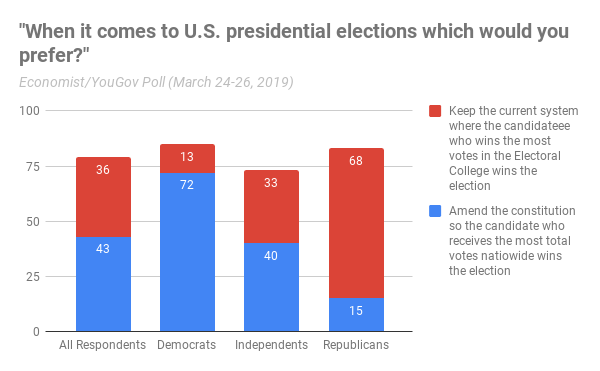 Do a Majority of Americans Want to Get Rid of the Electoral College? In my last post, I considered ways to reform the Electoral College (EC). One way is for states to join the National Popular Vote Interstate Compact (NPVIC). The other option is for states to adopt the Congressional District Method which Maine and Nebraska currently use to apportion their electoral votes. I noted in my analysis that it was not clear what Americans currently think of the EC or the NPVIC. Luckily, this week’s The Economist/YouGov Poll asked its panel a number of questions connected to this debate. The results tend to be in line with Gallup’s 2016 findings, which I discussed in my last post. The Economist/YouGov Poll asked three questions. 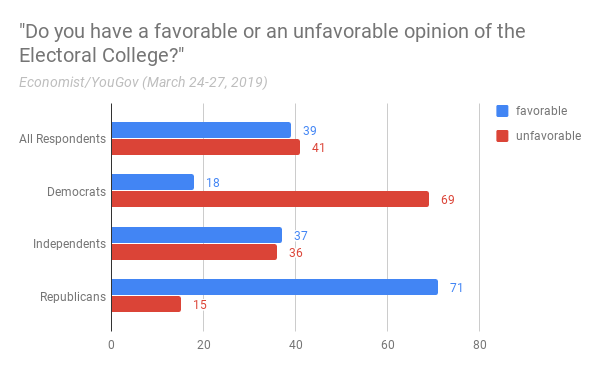 While the last of these questions did explain how the NPVIC works, it is surprising how many Americans are not sure whether or not they like the idea. What can we learn from this poll’s findings? Here are three observations, which largely reflect the country’s political mood. Democrats do not hold too much regard for the EC and they want to amend the Constitution to eliminate the system and let voters directly elect the president. 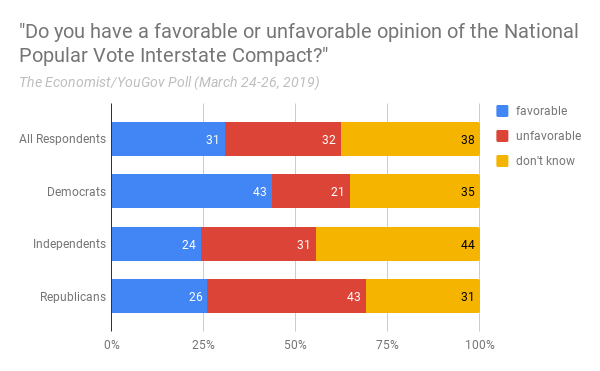 Republicans have favorable views of the EC and prefer to keep the system as is. Independents are divided on this issue and many of them are not sure what to think of the current electoral system. Given these divisions, the EC is here to stay! The best the EC’s critics can hope for is for states to reform how they award their electoral votes. Clearly, the NPVIC is one possible reform, but most people are not aware of this initiative. The other option is for states to adopt the Congressional District Method I reviewed in my last post. A final proposal, which I did not discuss in my proposal and has been discussed by considered by some state legislatures, is for states to apportion their electoral votes proportionally. FOLLOW ON ME TWITTER: @cyordan.